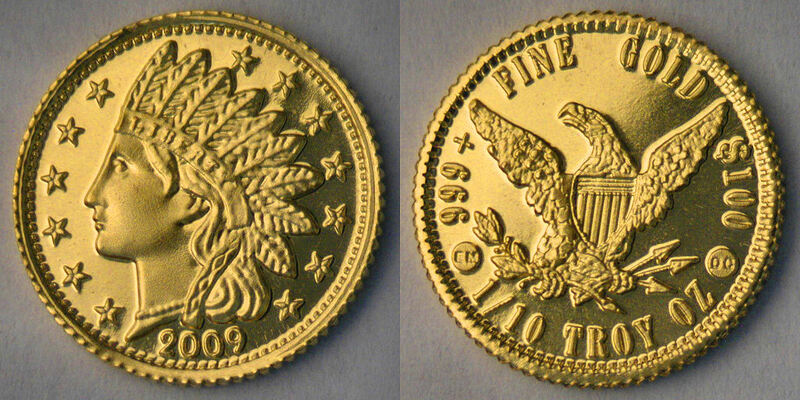 The design of this piece was modeled after the Indian Head Cent and the Quarter Eagle gold coins of the late 1800s, and is reminiscent of the privately-minted California fractional gold coins of the same era. All of these with a reeded edge are struck on a (former) US Denver Mint coin press. The small "EM" on the reverse at left is for David Emslie, a jeweler and gold refiner who produces the gold blanks. The Small "DC" on the reverse at right is for Daniel Carr (die engraver and minter).